It's unfortunate that this ground has to be gone over again but I guess it doesn't hurt for the voice of reason to be interjected at regular intervals to remind people that what a lot of other bloggers would have you believe otherwise, as you say, ain't necessarily so. Not sure where the mindset behind the anti-Stan brigade comes from, maybe because he was so vocal and high profile and the artists were quiet? Comic artists as a rule tend to keep their heads down, folk like Neal Adams being the exception of course, as one example. I know people have a right to an opinion but there is one comics blogger whom I quite respected, until he 'came out' as anti-Stan, so I don't check in on his posts as often these days as a result. Mind you that's not always the case - there are differences of opinion that I have with yourself over a couple of topics (which I see no point in airing) but I still look in here every day and comment as long as I feel I either have something to add or know something about. Didn't comment on the Christmas decos because I've had no favorites down the years for instance. Anyway, getting side-tracked there - I agree with your comments on Stan as that mirrors the situation as I see it as well. It's a bit like me selling a silver watch for £80 (and being happy to get it), then feeling cheated years later when the item has appreciated in value to a degree neither me or the buyer anticipated at the time of sale. That's essentially what Jack and Steve did, though Steve was less vocal about it. I'd be interested in knowing what topics you disagree with me on, because I never take it as an insult when people disagree with me - unless they're rude in the way that they do so. Also, in putting forward my own view on something, I'm not trying to change anyone's mind, merely show that there's another way of looking at things. I just like to provide balance if I can, but if people want to disagree with me, I don't lose any sleep over it. Anyway, hope you had a great Christmas, PC - get any nice collectables as presents? Christmas collectables?, not really as such this year. One of my (sometimes I think too many) other interests is wildlife and wildlife photography so I received a couple of the BBC Wildlife magazine annual photo contest winners volumes. Also as you know Dinosaurs battle Daleks for shelf space and this year I received a big Tyrannosaurus figure, which I have already reviewed on the Dino Toy Blog where I contribute reviews. Yes I think you are right on the money with your words on the later value of work that was perhaps just seen as more or less just a job at the time colouring the perspective of those involved, in this case Jack, Steve and Stan. Actually I can't think of too many topics that we are not in alignment on and I know that you and other readers of this blog are quite passionate about the topic I am about to mention, and I'll quite likely cop some flack, but here goes; I am okay with there being a female Doctor now. There is actually more scope to have a change of gender here than some of the other classic characters often mentioned as examples, such as say Tarzan, James Bond or Sherlock Holmes. Don't mind saying that with a couple of exceptions, while not perfect (what series ever is) I have been entertained by the new series. I stuck with out of loyalty but did not really enjoy the 80s incarnations of the various Doctors - bad casting choices followed in the wake of Tom Baker's departure. But that's my opinion, other may and do disagree. So, Hope I haven't put a black mark against my name for 'fessing up here on this one! Had a fine Christmas and hope that yours was okay, thanks for asking. I pretty much concur with your assessment. 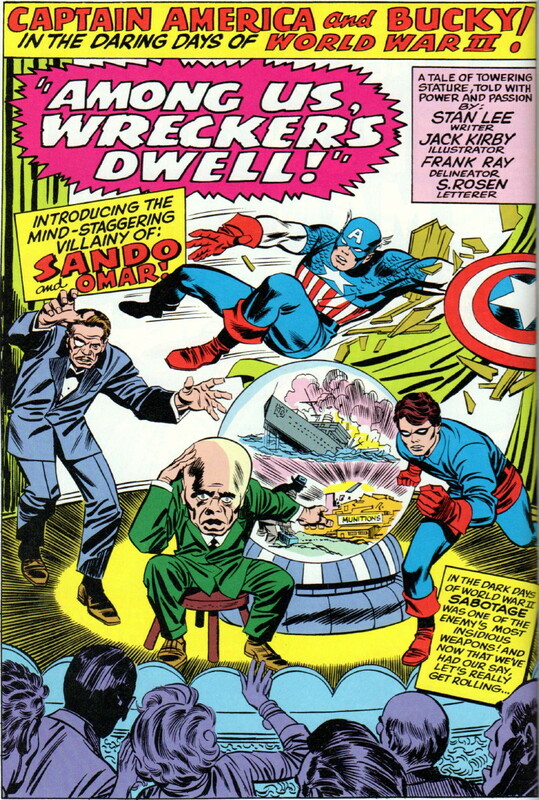 As you well know, I am like yourself a Jack Kirby fan but I don't want to fall into that cadre of folks who seek to elevate Jack by diminishing Stan. What's the point in that? Stan Lee was a breezy, self-reliant promoter who gave lots and lots of interviews and said things which were more or less true of his time at Marvel but not always so. Jack Kirby was a quiet genius talent who was content for much of his career to sit quietly munching cigars and draw fantastic comics. We are lucky indeed that they found each other or where would any of us be. In the United States we are getting well familiar with egos which huff and puff themselves up and play with the facts to do it. Stan did it with with friendly aplomb and no intention to injure only to promote his and Jack's work. He was Barnum and Marvel was the circus. Yeah, I was never too impressed with Peter Davidson as the Doctor, though I was no longer watching the show regularly by then anyway. Paul McGann's Doctor was more a move in the right direction, so it's a shame he never got to do a few series. I wouldn't actually mind a female Doctor - just so long as it was a separate character 'inheriting' the mantle - it's just this silly gender-changing business I don't like, because there's an agenda behind it, prompted by LGBT sensibilities. They should've made her the Doctor's (cloned) daughter and left the attempts at societal manipulation right out of it. I must confess I'm still deliberating whether to watch the New Year Special or not, as the Daleks are in it, but I'll make my final decision on the day. My Christmas was just how I like them, PC - quiet and uneventful. Long may it be so. I heard a radio interview with Dave Gibbons (and a couple of others) about Stan only yesterday, RJ, and DG was unstinting in his praise for Stan in regards to a project they'd worked on, saying that even after a 25 year career in comics, Stan taught him a thing or two about storytelling and was still (at the time) a creative force to be reckoned with. So I don't disagree with what you say, but I think that he was more than just a promoter, and often shaped the finished product in ways that Jack (and to a lesser extent Steve) just couldn't seem to see. But you're right - without their creative collaborations, just where would comics be today? And yes, just what planet is Trump on? There's a big fall coming I think. I did indeedy, CJ. Dave Gibbons seems more clued up than Alan Moore about Stan Lee, that's for sure. I hope this adds a bit to the discussion on why Stan was redoing these Captain America Stories. At DC all heroes had to have at least two jobs, one in their own comic or series and at least one other in a group book. From the then least popular, let say Aquaman, to the most popular, Superman and Batman characters had to appear in multiple books with many different authors. Superman was in eight. You therefore could NOT have any continuity or growth in the characters, that is nothing could really change. 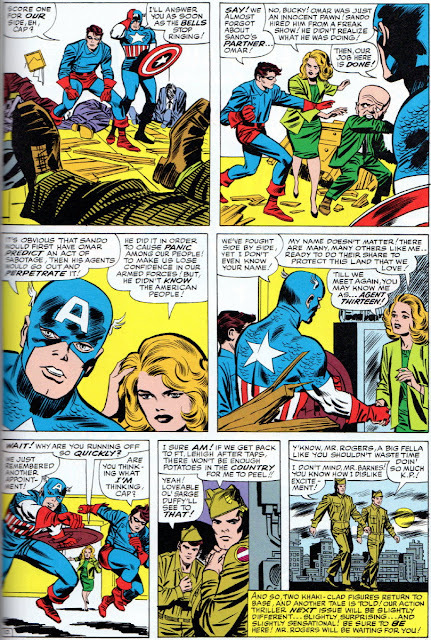 Stan did not like that and, famously, with Avengers #16, May 1965, he removed Iron Man, Thor, and Giant-Man from the Avengers. He also, with Strange Tales 134 removed the Human Torch from separate stories. 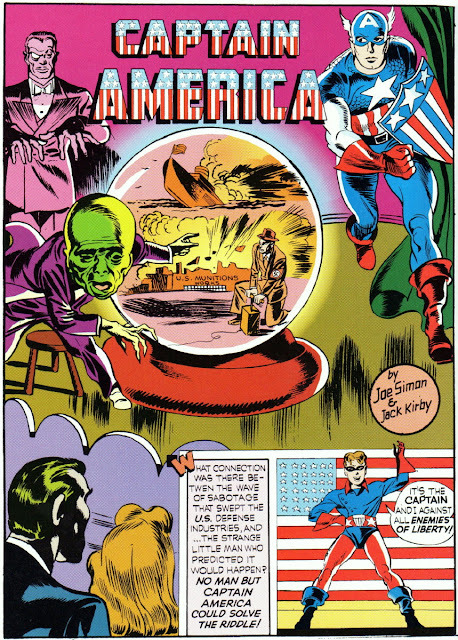 So Stan was reintroducing the WW2 era and all of its villains, including the Red Skull, in Tales of Suspense. To set the table for this era he certainly “borrowed” from the original stories. No one cared then, as they do today, about who plotted what and when. 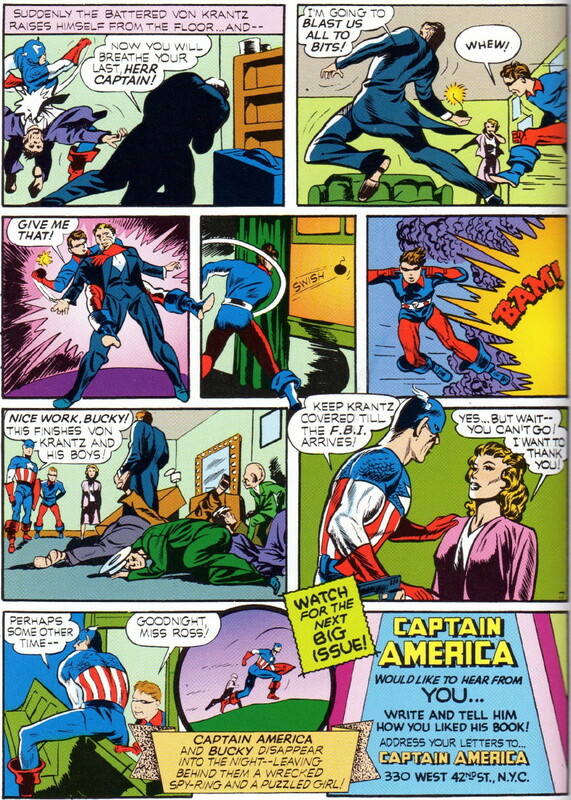 “Give the fans what they want” was always a key to Stan success and the fans, most of whom were born after WW2, wanted to see Cap in current day. 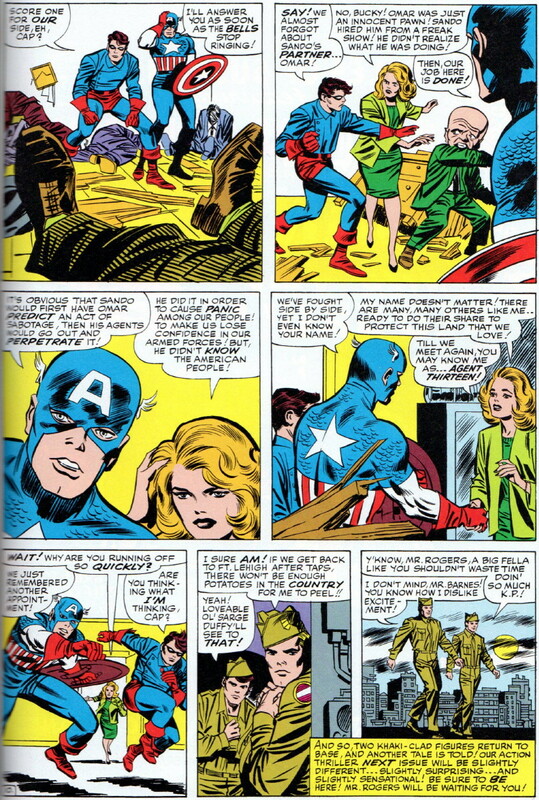 So Stan updated the era to the present in TOS and Cap remained the only hero, until Roy Thomas took over in the Avengers, that appeared in two continuities. Funnily enough, I immediately remembered previously reading Stan's reason for changing the Avenger's line-up once you'd reminded me, Barry. As to who plotted what and when, we can't even know, in this case, whether it was Joe or Jack who came up with the original idea, but the '60s version was certainly scripted by Stan, who tended to use the words 'scripted by' and 'written by' synonymously. I don't believe it was a calculated attempt to try and steal credit. Thanks for your valuable and appreciated contribution.